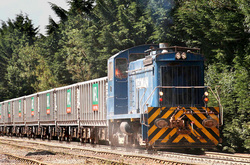 Many of these around the Country in private use.This set does not include ex-BR locomotives. 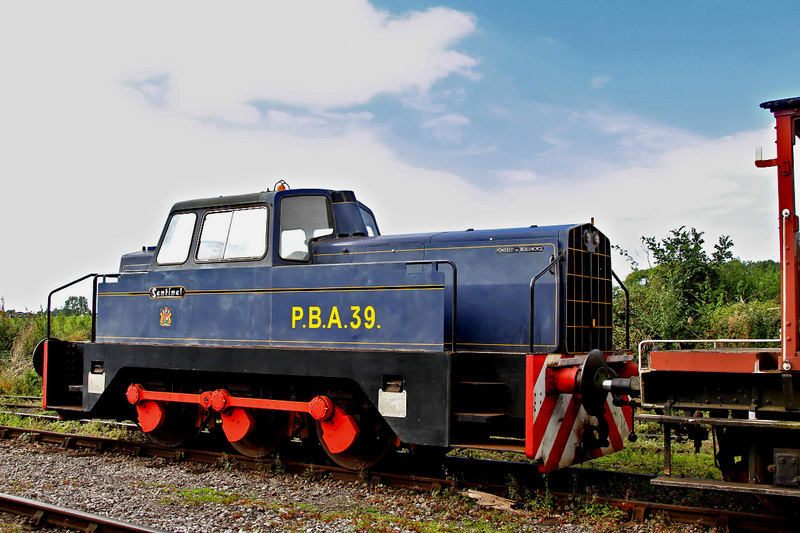 This loco has an interesting history.Built in 1952 by E E Baguley of Burton-on-Trent for export to Queensland-Australia. In 2001 it was bought and repatriated by the L&B Trust After various modifications including a replacement engine and the overall height being cut down to match the railways loading gauge it is now fully operational and with 180HP available a very strong loco.Viewed here in the siding at Woody Bay Station. DL26 is an 0-6-0 DM jackshaft driven shunter produced by Hunslet way back in 1958,works No-2662.The glorifies in the name 'The Rat' and although it was never a BR owned loco currently sports a BR style paint job c/w the lion and wheel decal.Viewed parked up having a sleep at the Didcot Railway Centre. 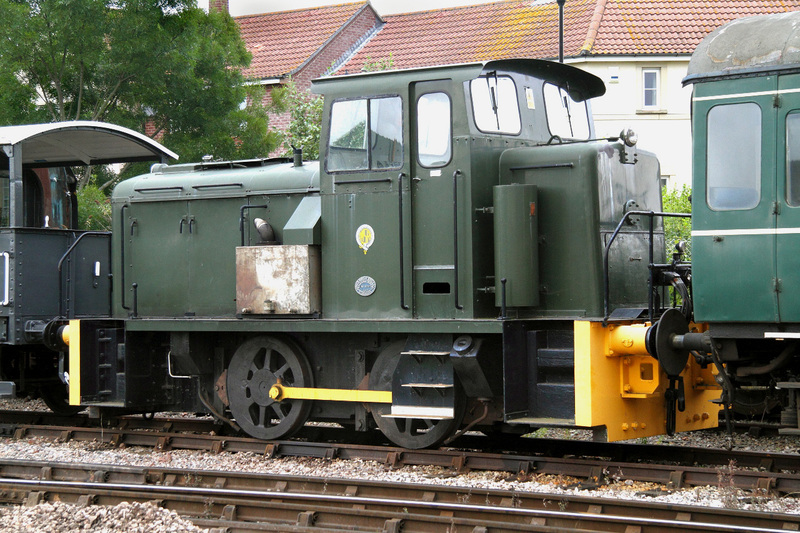 Cranmore on the ES-Rly has become something of a Centre for preserved Sentinel diesel shunters, there being quite a few around the place.This example 0-6-0 P.B.A.39 was built in 1965 and was used in Avonmouth Docks until the system there closed in 1983. 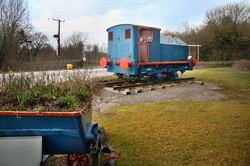 This is another view of 0-4VBT Sentinel 9387 now nicely restored cosmetically at Sandford and Banwell Railway Station Heritage Centre.Although this particular engine never worked near here a sister loco worked in a Sandford Quarry nearby bringing loaded trains up to the sidings here at the station.Hence the connection allowing this shunter being here to be relevent to the local history of the place. 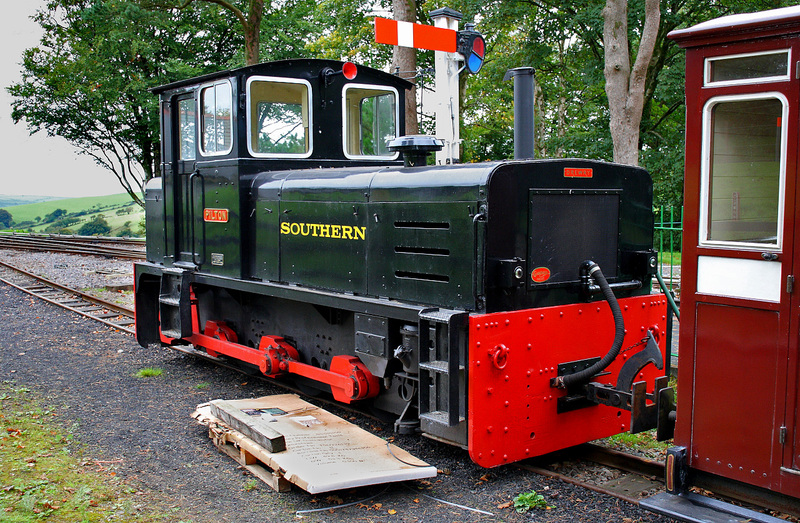 This small 0-4-0VBT was originally built in 1947(Works No-9387) by the Sentinel Company for Roads Reconstruction and was No-2 in their small fleet at Whatley Quarry nr Frome.After it was withdrawn in 1966 (approx) it became a static exhibit in the Welshmill Playground in Frome until H&S decreed such things were far too dangerous for small childern to look at! After that and until last year it became a Gate-Guardian at Tytheringtom Quarry North of Bristol.When it was decided to remove it from there it was donated to this small Museum here at Sandford and Banwell Railway Station Heritage Centre in North-Somerset.Although it is a non-runner it is nice to see this old Sentinel now has a safe home for the forseeable future! 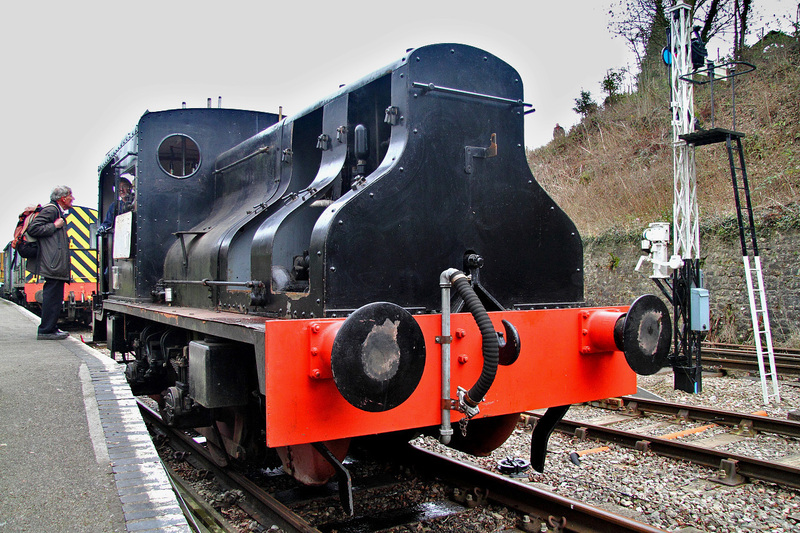 Sentinel 4wVBTG 7109/1927 'Joyce' which last ran in 1960 was finally restored to working order and moved under its own steam for the first time in 56 years just nine days ago.The twin-engine covers being left off for inspection purposes during these early running trials! 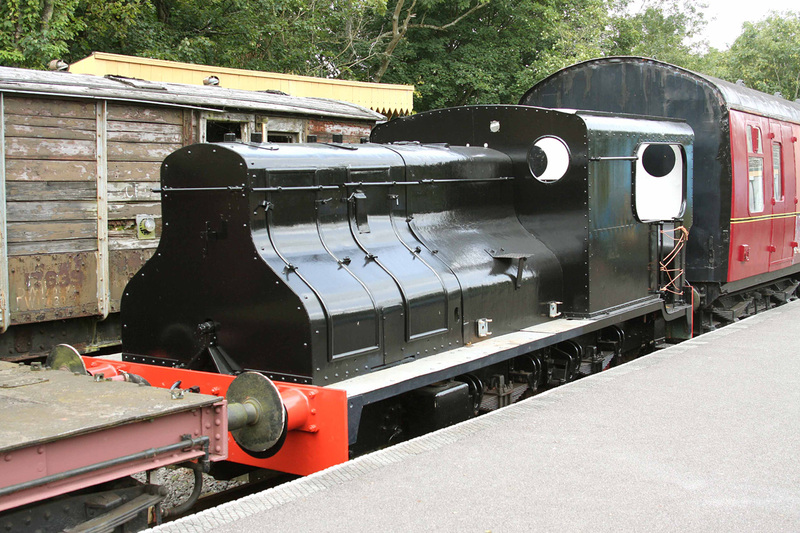 It is standing in Midsomer-Norton Station of the Somerset & Dorset Railway Heritage Trust in full steam! 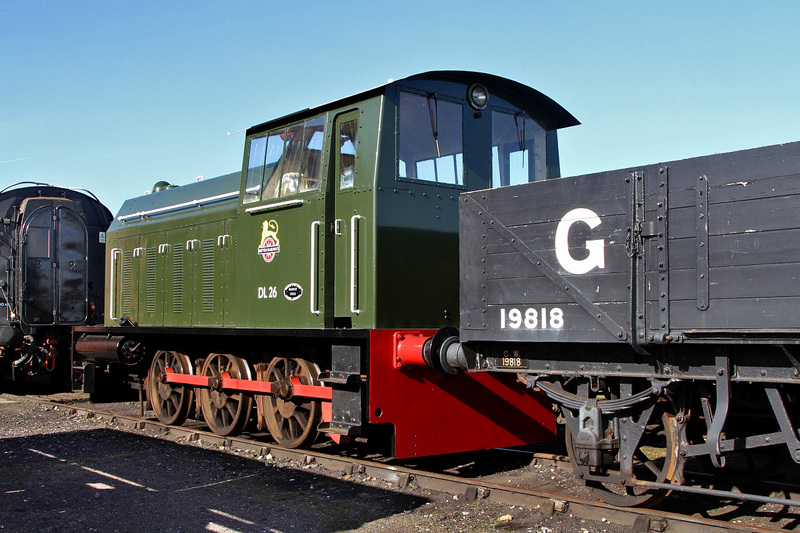 To find out all about this loco and its restoration and its 'look-alike S&D engines 47190/47191 just click HERE. 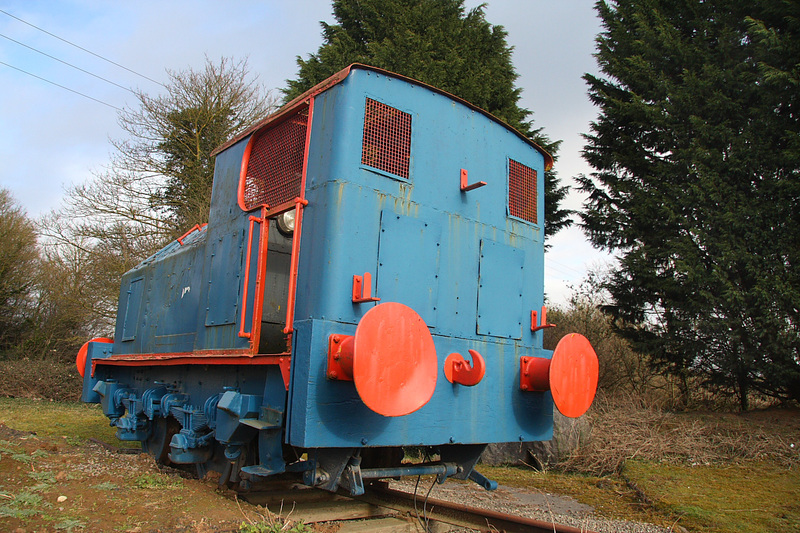 This is the locally famous little early Sentinal 0-4-0VBT Locomotive-Works No 7492 that until the mid-1950's from when purchased new in 1928 used to shunt the yards at the Keynsham-Somerdale Fry's Chocolate Factory.That place itself actually closed (Asset stripped) in 2011 by Kraft Foods after it took over Cadbury' who had absorbed Fry's earlier. 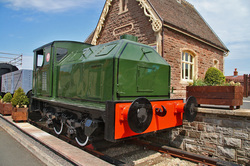 The loco was thought scrapped but rediscovered in Essex stored in an old overgrown dilapidated nissan hut over 50 years later in 2009.Now here at Bitton just a few miles from Keynsham it is fully restored to working order and just needs the sign-writing to complete the job. Next stop on our tour around Somerset was Minehead to picture a WC-Rly Tour with Ex-Purple Ronnie 57601 on but the combination of poor light and the crap WC-Rly loco livery rendered those shots pretty unuseable so instead here we have a static shot of an Andrew Barclay 0-4-0 Shunter from 1972, Number-578.This Ex-Ministry of Defence--Royal Ordanance Department (ROD) engine has been here on the West Somerset Railway since it was de-commissioned from Army use at Puriton nr Bridgewater in 1994.Naturally it still wears the drab-green army livery. 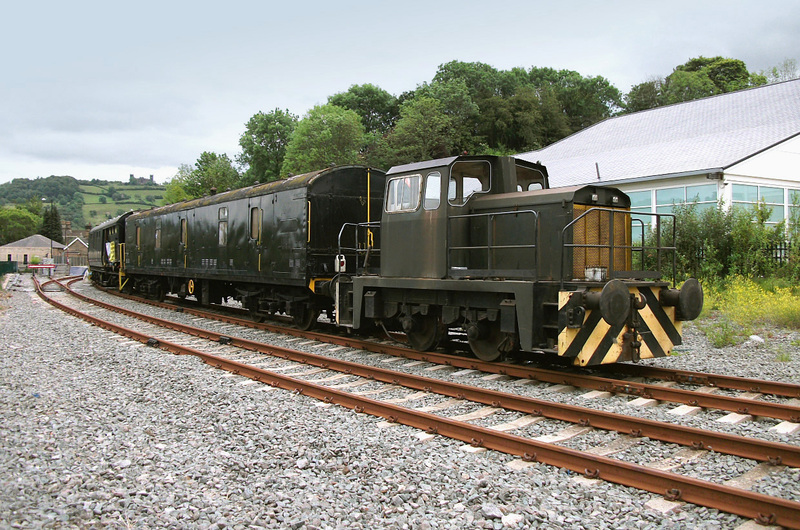 The Cardiff Tremorfa Steel Works now uses a couple of recently rebuilt Industrial Shunters instead of the old Class-08 type.Both were originally Thomas Hill-Vanguard Hydraulic 0-6-0's that have been reworked by Hunslet.This one DH50-2 used to work at Llandarcy Oil Refinary before being 'preserved' then 'unpreserved' for rebuilding and use here.The other similar Unit DH50-1 used to work at Westbury Cement Works which of coarse is now closed. 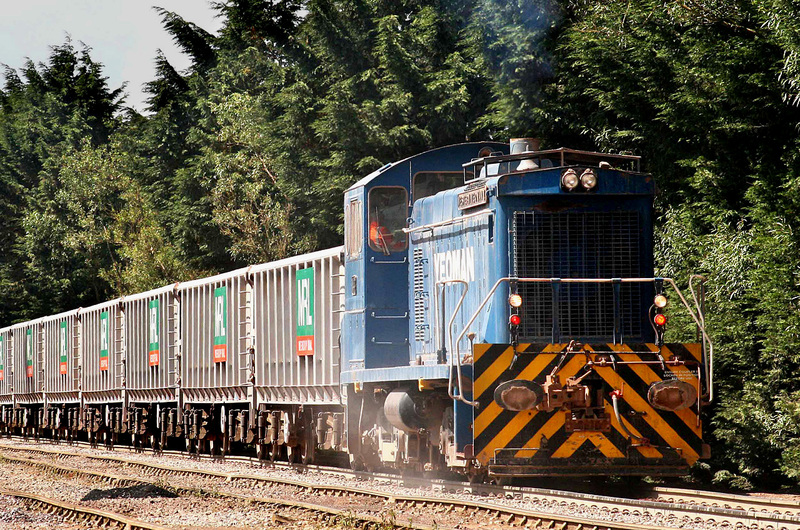 So here is DH50-2 slowly pushing back through the Jungle a train of loaded scrap into the Celsa Plant for processing.The train was brought into the adjacent sidings at Tidal Yard by a Freightliner duty from Dagenham. 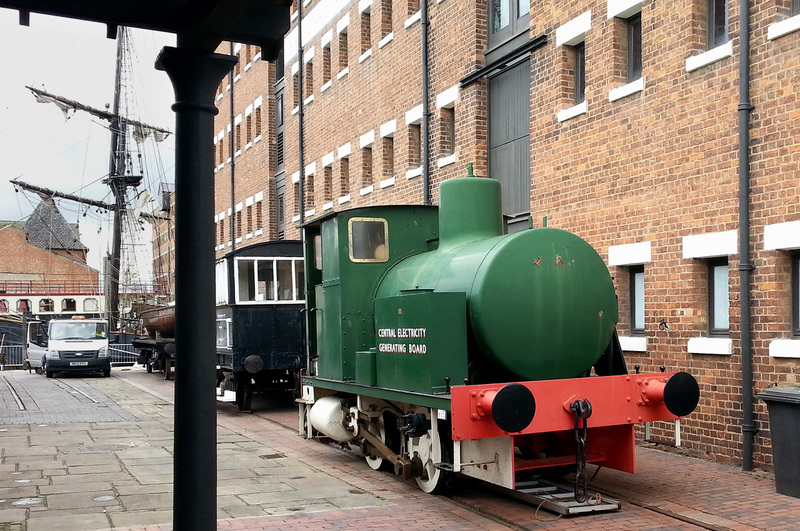 Whilst on a trip to the Gloucester Quays Outlet Shopping Centre I came across this loco in the adjacent Gloucester Waterways Museum.The shot was taken through a very small gap in the surrounding fencing with a Samsung Galaxy-S3 Mobile Phone. 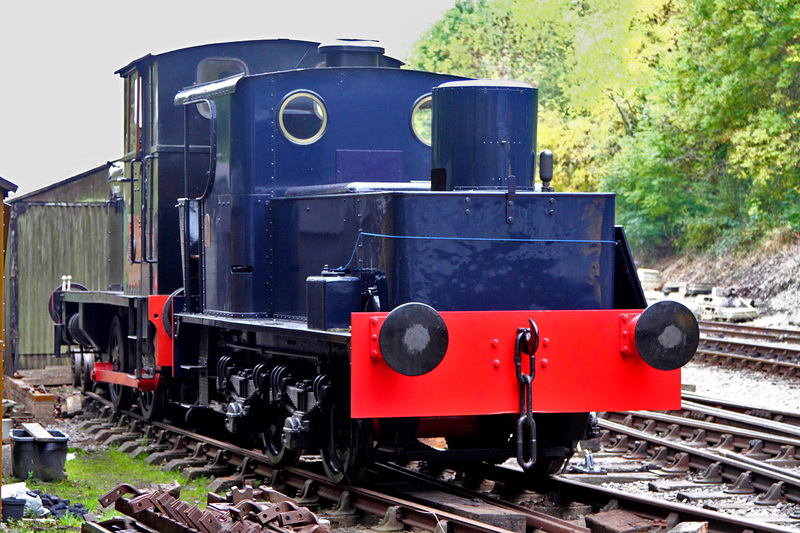 The engine is a Fireless 0-4-0 manufactured by Andrew Barclay in 1942. 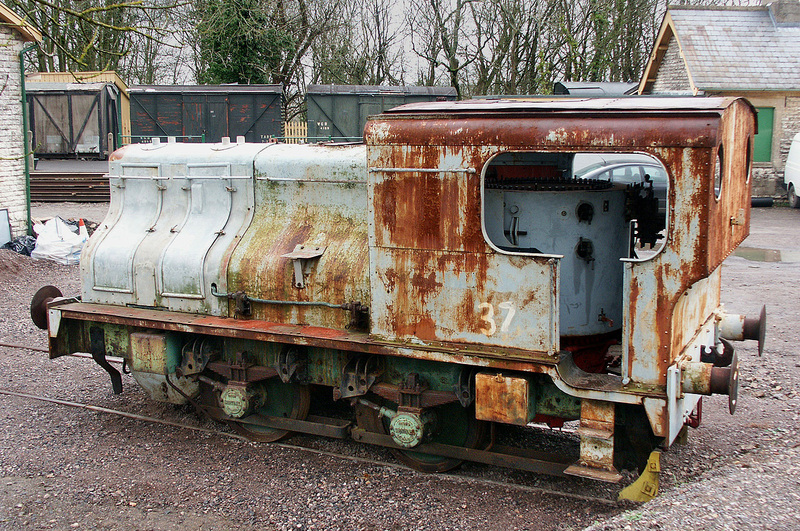 Number 2126.Apparantly it is in full working order having been restored several years ago. The former Number-2 in the Roads-Reconstruction small fleet of Sentinal Steam Engines that used to work between Whatley Quarry and Hapsford Exchange Sidings now does duty as Gate-Guardian at Tytherington Quarry in North Bristol.Not long after this engine was taken out of service a new line was constructed including 2 tunnels enabling mainline locomotives to enter the Quarry at Whatley.The need then for these 0-4-0 short wheelbase engines (Including the diesels that replaced the steam) no longer applied. For a good set of pictures of these Sentinal type engines at work at Vallis Vale Frome including this engine dumped in 1967. As of early 2015 this little Sentinel has been removed from Tytherington for eventual display at Sandford Railway Station Museum in Somerset. Click HERE to see it being removed! 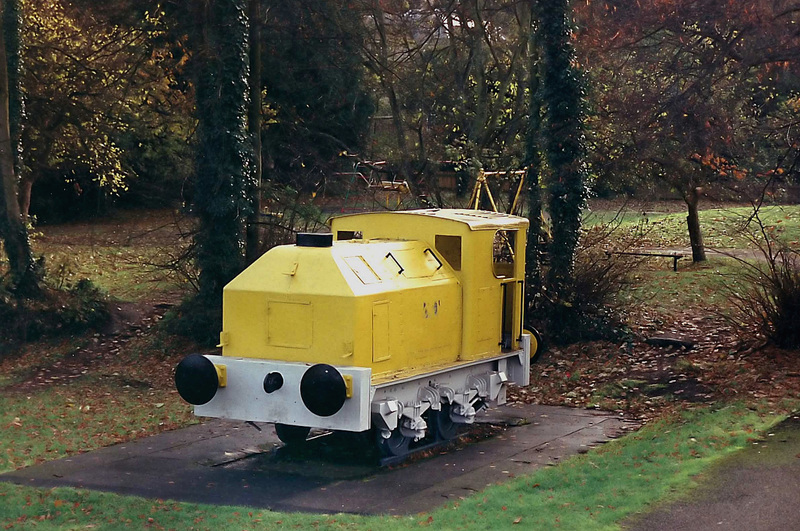 Something I have been meaning to do for quite sometime was to have a look at this old Sentinal Steam Engine that was once in pride of place in Welshmill Playground in Frome.Whilst there it was liveried in ARC-Yellow but is now in Hanson-Blue.Originally built in 1947 (Works No 9387) it became Number 2 in the Road Reconstruction fleet based at Whatley Quarry.After retirement in 1966 (approx) it eventually ended up in the Playground.However, ever ridiculous Jobsworth Health&Safety regulations required its removal in case some child broke a fingernail or got scratched! 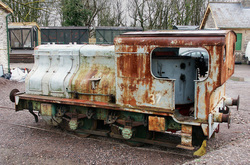 For a long time I though it had gone for scrap but no! 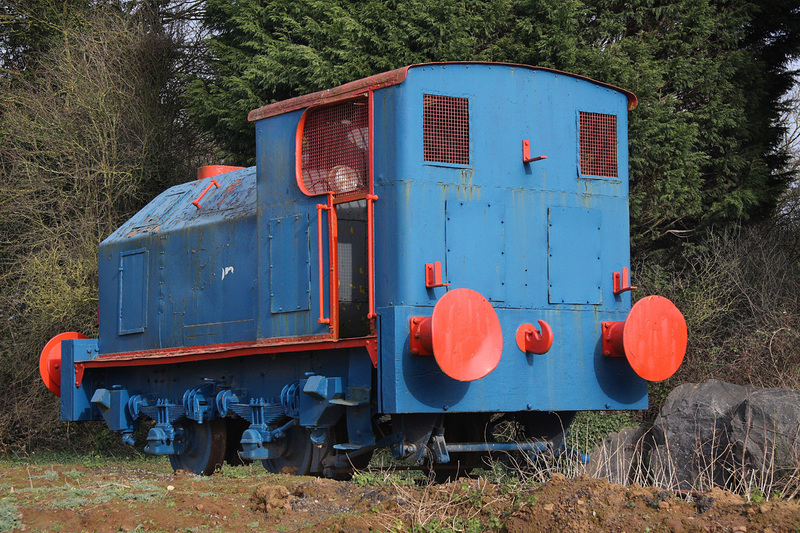 It went to Tytherington-Quarry in North-Bristol and to this day does duty as a Gate Guardian. 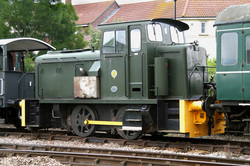 To see this engine when it was the playground in Frome in the 1990's click HERE. Something I have been meaning to do for quite sometime was to have a look at this old Sentinal Steam Engine that was once in pride of place in Welshmill Playground in Frome.Whilst there it was liveried in ARC-Yellow but is now in Hanson-Blue.Originally built in 1947 (Works No 9387) it became Number 2 in the Road Reconstruction fleet based at Whatley Quarry.After retirement in 1966 (approx) it eventually ended up in the Playground.However, ever ridiculous Jobsworth Health&Safety regulations required its removal in case some child broke a fingernail or got scratched! 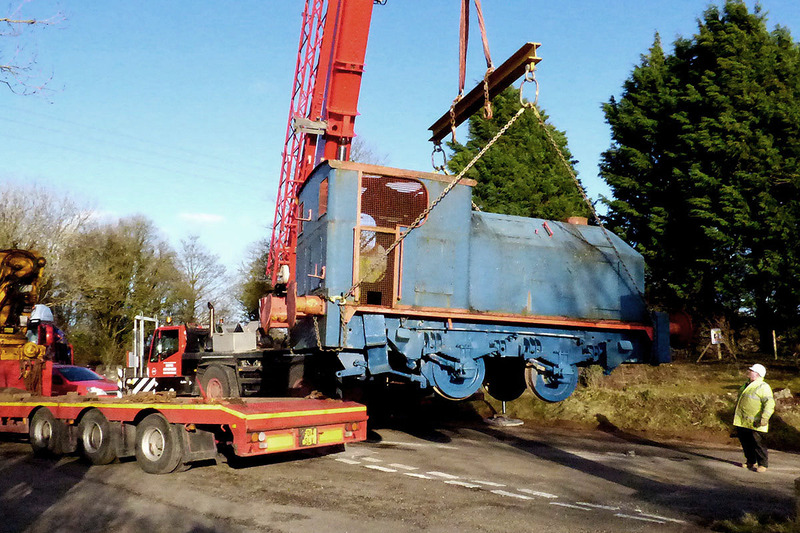 For a long time I though it had gone for scrap but no! 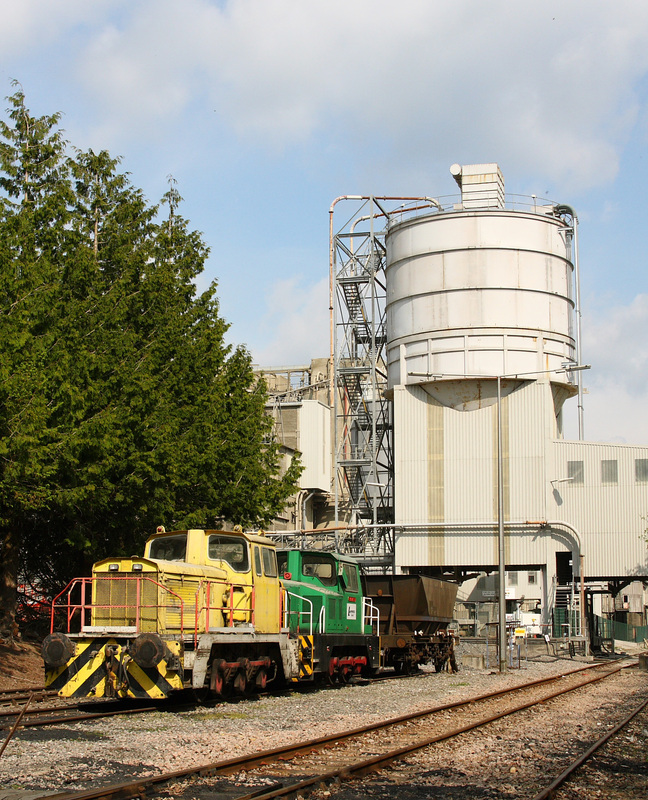 It went to Tytherington-Quarry in North-Bristol and to this day does duty as a Gate Guardian. Standing at Matlock Station Peak Rail --(To be officially opened on 2nd July 2011) with a works train involved with restoring the mainline link there with the UK network is 265V a Thomas Hill Vanguard 4wDH constructed in 1975.Although painted in the style of an MOD loco this one only ever worked as a civilian engine before coming to Peak Rail. 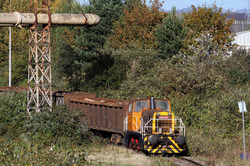 A sad shot this.These two engines sit parked up.Their work here done as this complex at Westbury LeFarge ceased to produce cement just over two weeks previously.Both unidentified and could not investigate further as a few days later whole area was encased in Palisade Fencing,probably to keep out the pikies! Lefarge-----A French Company owning a British one working for the French! Footnote. 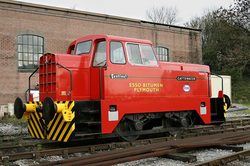 The yellow Hunslet originally built in 1971 has recently reappeared at the Celsa-Works in Cardiff numbered DH50-1 in GBrF colours fully refurbished by the Hunslet Engine Company. 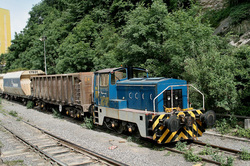 It was noted there in early December 2011. 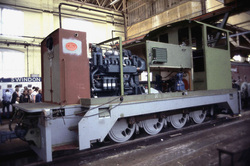 This is a Sentinel Roll-Royce engined diesel 0-4-0 chain drive DH number-199.Pictured shortly after it had been fully restored at Cranmore on the East Somerset Railway.The name 'Cattewater' is carried marking its use there at Plymouth.Unfortunately no vacuam braking equipment is fitted so this immaculate machine is restricted to yard shunting and possibly short unfitted freights with a brakevan attached. This Sentinal 0-4-0 number 7109 bears a striking resemblence to the pair 47190/47191 that used to be allocated to Radstock just a few miles from this location at Midsomer Norton Station.Although never a BR engine it certainly seems fitting it should end up here so close to where the pair that were worked.Originally built to work at Croydon Gas Works in 1928.It stayed there all its working life until 1960. Click HERE for the full story and history of this unique loco. 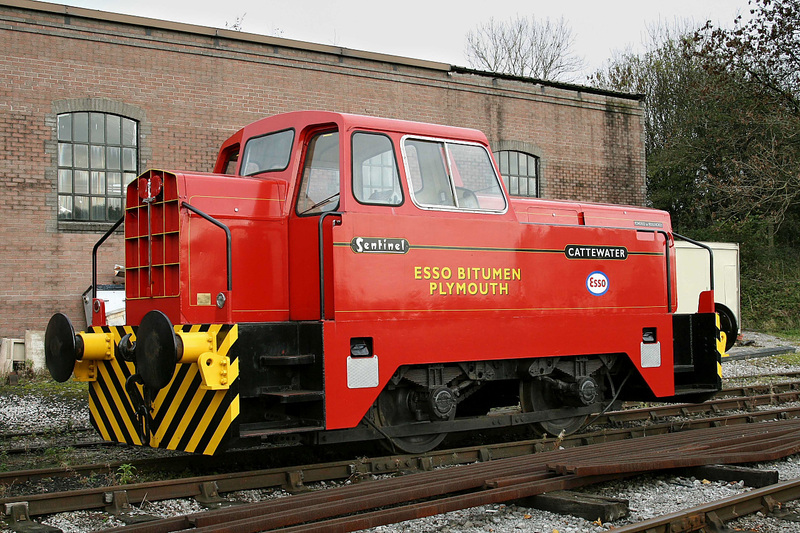 This huge 'out of UK guage' locomotive is 'Western Yeoman II' Number-44 the famed GM/EmD SW1001 Bo-Bo american built shunter that has been in Merehead Quarry sidings now for well over thirty years.It was the superb ability and reliability of this Unit that prompted the Company to order the Class-59's.So in effect this loco here truly started the GM revolution on the UK locomotive scene. 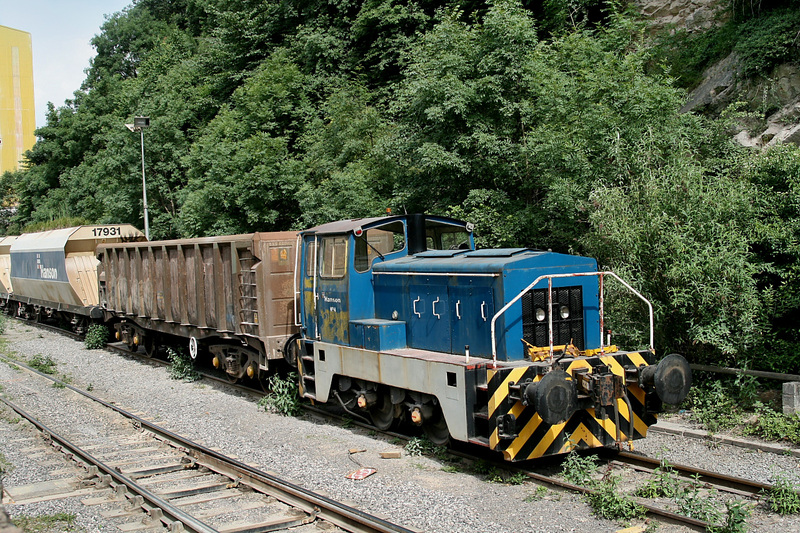 Here it is seen shunting a loaded rake of boxes in the Merehead departure sidings during an Open-day held there in June-2008. 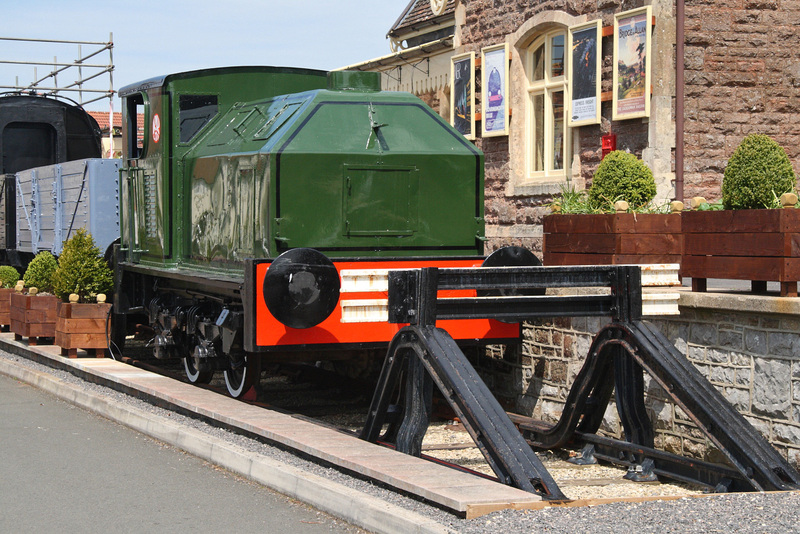 Here is the unique 'double-engined' Sentinel 7109 not long after it arrived at the then relatively new preservation site at Midsomer-Norton Station on the long closed S&D.This loco is an almost exact replica of the pair of this type that worked a few miles away at Radstock shunting .These engines were 47190 & 47191 which were withdrawn by 1960 and of coarse were quickly cut up for scrap.Well done Andy Chapman for 10 years of dedicated work to finally get this locomotive back into full working order in February-2016. 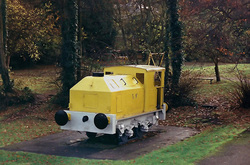 After this 0-4-0 VBT Sentinal Shunter was retired from Whatley Quarry in around 1966 it eventually ended up in the WelshMill Childrens Playground in Frome literally within a few miles of where it worked at Hapsford Exchange Sidings and the short branch to Whatley.Originally it was built in 1947 as Works-No 9387 for Roads-Reconstruction who operated Whatley at that time.Loco is seen in ARC colours in the playground.Unfortunately it was removed in the 1990's due to H&S paranoia but still suvives in 2012 as 'Gate Guardian' at Tytherington Quarry in North Bristol.It now wears the colours of Hanson. Click HERE to see it now. Here is a shot of one of the final batch of locomotives ever constructed at Swindon-Works.It is a metre-gauge 0-8-0 525hp Diesel Hydraulic Shunter number-4724 from a batch of 20 in the range 4718 to 4737.It was part of an order for Kenya-Railways and was finished in a blue livery.Some of this class are still working there in 2013 32 years later.Swindon Works of coarse is now flattened and where this engine was standing is a Shopping Outlet Centre. 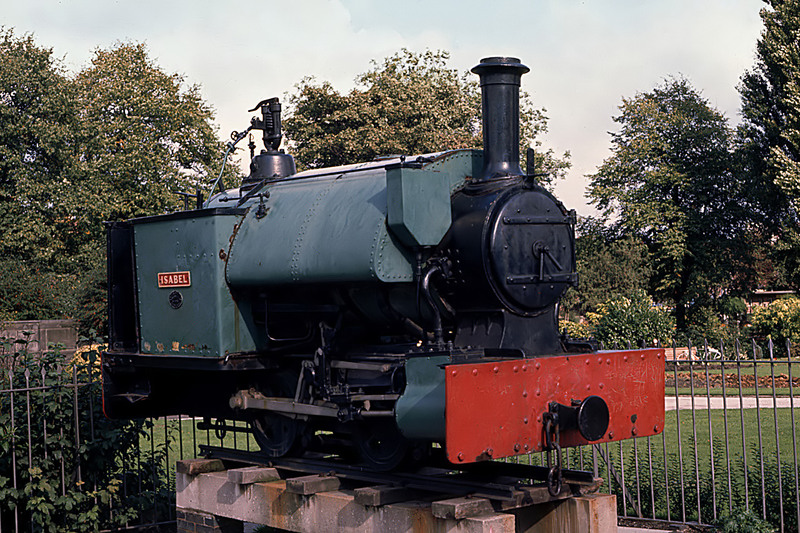 This small 0-4-0 named 'Isabel' stood as a gate-guardian at Stafford WCML Station slowly rusting away for many years.Eventually it became so decrepid the chimney actually collapsed through the smokebox!. 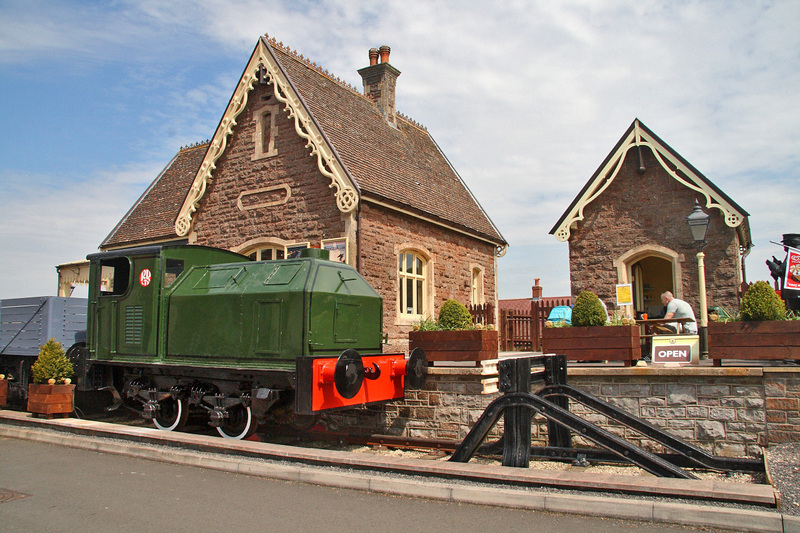 She was actually built by W G Bagnall in Stafford hence the plinthing in public view there. 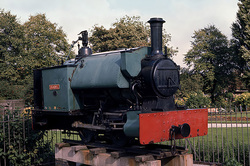 'Isabel' was eventually moved in 1983 and after a full overhaul went to The Amerton Railway 6 miles NE of the Town where she remains today. 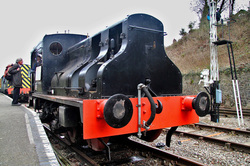 For more information on this little Saddle-Tank click HERE.